Welcome to the review of yet another unknown, good band. SOULFALLEN is one of those many Metal bands out there that play good Metal, but was less fortunate in the area of getting recognized. Hopefully this will change with their new album. SOULFALLEN were founded in 2003, in Finland. Grave New World is their second full-length album, following World Expiration in 2007 and two demos Dark Remains in 2004 and Death OF The Tyrant in 2006. They play melodic Death Metal, with a sad and pessimistic overtone, each song a unique composition, proof of the abilities of the band to blend the melodic parts and the Death Metal parts with a skill that sets them aside from many bands of similar musical orientation, avoiding the restlessness of mainstream. In Grave New World the band hardens their music a little more, returning to the more aggressive humble beginnings, with more guitar riff outbrakes and a stronger representation of the drums, more evident in songs such as Devour, To The Wolves At My Door and This World Is Bleeding Flies. The keyboards are ever present to augment the melancholy and add a dark symphonic feeling to the sum of the album. Although there are times that the keyboards seem to overshadow the guitars, it is made in such a way that the resulting sound is solid and loses nothing to its strength and melancholy. 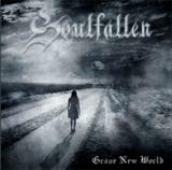 SOULFALLEN wrote in their site that Grave New World is the soundtrack of the burial of an entire world, a sad nearly lamenting album that has songs of loss and tragedy. True to that, its lyrics are well written and fit perfect with the music, another example of the band's great musical abilities. Lyrics and sound make Grave New World truly a dark soundtrack to a world moving ever away from the light. Although Grave New World is a melodic Death Metal album SOULFALLEN have managed to give it in such a way that, even if someone is not a fan of the genre they are playing, they should give it a try. SOULFALLEN with their second album prove that they are a band that deserves our attention and shows signs of a promising future.